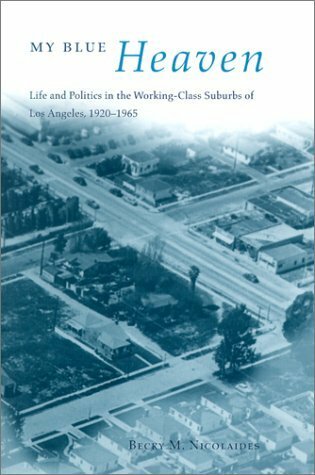 Becky Nicolaides’ My Blue Heaven is a marvelously well researched and incredibly detailed look at the lives of people in South Gate, one which challenges a number of common assumptions about the suburbs while providing evidence for others. I love how it details the ways that ideas and meanings of home and community were constructed, and their change over time. My Blue Heaven‘s principal argument is that from the 1920s through WWII, home was primarily a survival strategy for the working class. They bought affordable lots and built homes as and when they could, using extensive yards to grow food, thus provisioning themselves against want outside of the cash economy. At this time, residents felt that lower taxes were more important than school segregation for example, highlighting the precariousness of their living situation. This shifted after World War II, as South Gate came to resemble other suburbs such as Lakewood in its infrastructure and tract housing, and as owner salaries rose and situations improved, their homes became principally investments and marks of status. This led to a very strong feeling around taxes. Thus their bitter struggle against school integration, and defensive posture around residential integration to protect home values. When boom hit bust in the 1930s, their assumptions about the role of individuals and government began to shift. As both the politics of development and education revealed, residents began with the unspoken assumption that the burden of financing municipal services-from streets to schools-should fall on the backs of individual property owners, including the humble working-class home owner. Embracing an ethos of privatism, they believed property ownership conferred the responsibility of municipal stewardship. All property owners- regardless of wealth-became urban stewards. It was thus up to individuals, not government more broadly, to pay for services. In a poorer suburb like South Gate, residents simply chose to limit these services, to create a modest infrastructure that they could reasonably afford. There was no assumption that urban services were a right, and that they should be financed through a redistributive system of taxation. This reflected their deeply held ideals of individualism, self- help, hard work, plain-folk Americanism’ and anticommunism, an outlook asserting that urban fiscal policy ought to be based on a private approach rather than a collective one. It is extraordinary to watch a working class community shift from supporters of EPIC and the New Deal, to supporters of conservative Republicans such as Ronald Reagan. But through this historical view it finally makes some kind of sense…it also contains a lot of more ethnographic and quite fascinating information on daily life, entertainment, and particularly labor. Nicolaides argues that home became the center of people’s lives rather than their work, and explores some of its implications for labor. Definitely worth checking out if you’re interested in any of these topics, and a beautiful example of an in depth historical view of a single suburb that manages to give insight into key historical forces happening all over the country.